When you live in south Florida, you can grow most tropical plants. Take advantage of this ability when you begin to landscape your yard—plant palm trees, hibiscus, citrus, bougainvillea, orchids, bananas and most foliage plants that are grown as houseplants farther north. Coleus, philodendron, dieffenbachia, ti plants and many others will perform well outdoors in south Florida habitats. Also consider growing carefree Florida native trees and wildflowers for a natural look. Palm trees and Florida are almost synonymous. Many different species are well adapted to South Florida landscapes. Some of them include areca palms, coconut palms, foxtail palms, windmill palms, and the large palms, such as the Queen palm and the Phoenix date palms. Tall palm trees can take up a large area of your yard when they grow to maturity, so measure your yard and consider that the small potted palm you just bought at the nursery will not stay small for long. Be sure not to plant a palm too close to any building or in an area where its falling fronds might damage cars, people, pets or anything else that might pass under it. 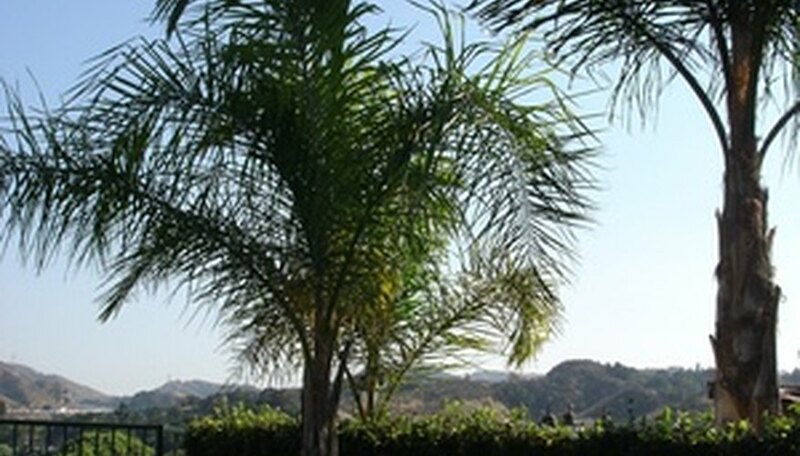 Large palm trees are appropriate for use along the rear part of fairly large yards. Smaller palms, such as the areca and the pygmy date palm do well in large pots that you can use to decorate your patio or deck. Add color to your landscaping by planting coleus, hibiscus, orchids, bougainvillea, passion flower vines, impatiens, bromeliads and most other flowering tropical plants. Because South Florida rarely receives frost, all of these flowering plants will perform well throughout the winter when you plant them in the ground. Plant smaller flowering plants in the front of flower beds and plant vines, such as bougainvillea and passionflowers against fences or trellises. The smaller flowering plants, such a coleus, orchids and impatiens are well suited to growing in pots and can add a nice touch to your yard when you plant them in decorative pots. Take advantage of the South Florida climate by growing some of your own fruit. Even if you have a small yard, consider growing at least one citrus tree, such as a naval orange. Lemons, limes and other citrus also do very well in south Florida’s year-round mild climate. You might try growing a banana, a mango tree, guava, avocado or other tropical or semi-tropical fruit. Plant trees that will become large toward the back boundary of your property so they don’t shade other plants. Citrus trees do well in pots and can add to the décor of your deck or patio. The southern tip of Florida is classified USDA climate zone 10, where the winter temperature never drops below 35 degrees Fahrenheit. If you live in Miami-Dade, Collier or another county in southeast or southwest Florida, think about adding some Florida natives to your landscaping. Examples of native Florida plants that perform well in southern areas of the state include sweet acacia and red maple trees, the giant leather fern, indigo bush, butterfly weed, tarflower, gumbo-limbo, golden canna, buttonbush, sandhill dayflower, string lily, seaside gentian and many more. Some introduced plants like growing in South Florida so much that they have taken over areas where native plants once grew, causing some of them to become threatened or endangered. Although the list of plants to avoid is long, beware that you don’t include a tea tree (Melaleuca), alligator weed, water hyacinth, orchid tree, asparagus fern, Australian pine or any other plant classified as invasive in your landscaping (see Resources). The Florida Native Plant Society cautions residents that when invasive species escape cultivation they can displace native plants and animals that rely on them for food or shelter. Invasive species, they continue, are a danger to the native environment as well as to Florida’s economy. What Plants are Good for Containers in California?